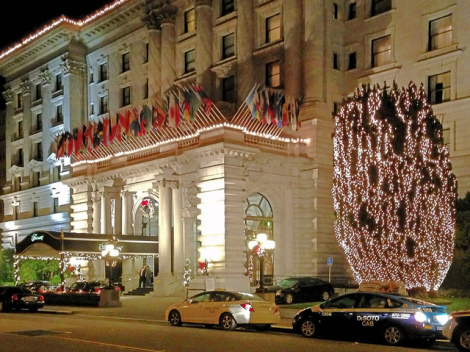 The Sloat Singers performed their first concert of the season in the lobby of the Fairmont Hotel on December 2, 2014, delighting parents and hotel guests with a wonderful array of holiday songs. The chorus director, Shawn Aluk, provided piano accompaniment, and guest conductor Hilda Chavez directed the 3rd, 4th and 5th grade students for the performance. Singers were treated to hot chocolate and cookies, compliments of the Fairmont, following the performance. If you missed it, catch them at the Scottish Rite Auditorium on Monday, December 8th at 6:30pm for the “Singing for Toys” concert sponsored by SFUSD Visual and Performing Arts Department. Admission is free with the donation of a new, unwrapped toy.